Figure 1 Zircon distributions. (a) Theoretical and empirical relative zircon crystallisation distributions f(tr), scaled from initiation to termination of zircon crystallisation. 1: Kinetic model of Watson (1996), based on zirconium diffusion constraints. 2: Thermodynamic model of Keller et al. (2017) using MELTS calculations. 3: Observed zircon crystallisation distributions of Samperton et al. (2017), shown as a kernel density estimate for all autocrystic zircons, truncated at +/- 1 kernel bandwidth. (b-d) Representative synthetic zircon age datasets for a variety of ∆t/σ at N = 10. (e) Example dataset with N = 100 at ∆t = 1σ; note the range is greater than in c despite lower ∆t. (f) Schematic illustration of the three most common volcanic zircon age interpretations. Reiners, P.W., Carlson, R.W., Renne, P.R., Cooper, K.M., Granger, D.E., McLean, N.M., Schoene, B. (2018) Geochronology and Thermochronology. John Wiley & Sons. Schoene, B. (2014) 4.10 U–Th–Pb Geochronology. In: Rudnick, R.L. (Ed.) Treatise on Geochemistry, Second Edition. Elsevier, 341–378. Bowring, S.A., Grotzinger, J.P., Isachsen, C., Knoll, A., Pelechaty, S., Kolosov, P. (1993) Calibrating rates of early Cambrian evolution. Science 261, 1293–1298. Mundil, R., Ludwig, K.R., Metcalfe, I., Renne, P.R. (2004) Age and Timing of the Permian Mass Extinctions: U/Pb Dating of Closed-System Zircons. Science 305, 1760–1763. Harrison, T.M. (2009) The Hadean Crust: Evidence from 4 Ga Zircons. Annual Review of Earth and Planetary Sciences 37, 479–505. Schoene, B., Samperton, K.M., Eddy, M.P., Keller, G., Adatte, T., Bowring, S.A., Khadri, S.F.R., Gertsch, B. (2015) U-Pb geochronology of the Deccan Traps and relation to the end-Cretaceous mass extinction. Science 347, 182–184. Cherniak, D.J. (2003) Diffusion in Zircon. Reviews in Mineralogy and Geochemistry 53, 113–143. ), U-Pb zircon ages are traditionally interpreted within uncertainty as reflecting bulk crystallisation or eruption. Lissenberg, C.J., Rioux, M., Shimizu, N., Bowring, S.A., Mével, C. (2009) Zircon Dating of Oceanic Crustal Accretion. Science 323, 1048–1050. Wotzlaw, J.F., Schaltegger, U., Frick, D.A., Dungan, M.A., Gerdes, A., Günther, D. (2013) Tracking the evolution of large-volume silicic magma reservoirs from assembly to supereruption. Geology 41, 867–870. Mattinson, J.M. (2005) Zircon U–Pb chemical abrasion (“CA-TIMS”) method: Combined annealing and multi-step partial dissolution analysis for improved precision and accuracy of zircon ages. Chemical Geology 220, 47–66. Ellis, B.S., Mark, D.F., Troch, J., Bachmann, O., Guillong, M., Kent, A.J.R., von Quadt, A. (2017) Split-grain 40Ar/39Ar dating: Integrating temporal and geochemical data from crystal cargoes. Chemical Geology 457, 15–23. Samperton, K.M., Schoene, B., Cottle, J.M., Keller, C.B., Crowley, J.L., Schmitz, M.D. (2015) Magma emplacement, differentiation and cooling in the middle crust: Integrated zircon geochronological–geochemical constraints from the Bergell Intrusion, Central Alps. Chemical Geology 417, 322–340.
) shown in Fig. 1f. Crowley, J.L., Schoene, B., Bowring, S.A. (2007) U-Pb dating of zircon in the Bishop Tuff at the millennial scale. Geology 35, 1123–1126. Wendt, I., Carl, C. (1991) The statistical distribution of the mean squared weighted deviation. Chemical Geology 86, 275–285. The possibility for residual lead loss, even following chemical abrasion, substantially complicates each of these three approaches, as does the common practice of excluding outliers subjectively identified as antecrysts. While interpretation (1) is likely to systematically pre-date the true eruption age, the accuracy of (2) and (3) has not been well tested. Moreover, while each interpretation has advantages, it is not clear that any of the three yields a statistically robust estimate of eruption age. In order to address these problems, we investigate the performance of common weighted-mean, youngest-zircon, and MSWD-test age interpretations, as well as that of an alternative likelihood-based Bayesian approach. To this end, we consider two dimensionless variables which, together with the pre-eruptive zircon crystallisation distribution f(tr), determine the behaviour of all possible volcanic zircon age interpretations. The first is ∆t/σ, the ratio of the true crystallisation timescale ∆t to analytical uncertainty σ, while the second is simply N, the number of analyses (Fig. 1). For instantaneous crystallisation (∆t/σ = 0) with Gaussian analytical uncertainty, both the mean and variance of an analytical dataset are constant as a function of N, and a weighted-mean interpretation is fully justified. However, these assumptions fail for non-trivial ∆t, leading to systematic bias and potentially major over-estimation of accuracy and precision at high N. In contrast, at high ∆t/σ, a youngest-zircon estimate is likely to outperform a weighted-mean interpretation, but may systematically pre- or post-date the true eruption age as a function of N.
Caricchi, L., Simpson, G., Schaltegger, U. (2014) Zircons reveal magma fluxes in the Earth’s crust. Nature 511, 457–461. Caricchi, L., Simp son, G., Schaltegger, U. (2016) Estimates of volume and magma input in crustal magmatic systems from zircon geochronology: the effect of modelling assumptions and system variables. Frontiers in Earth Science 4, 1–15. ), who assume constant zircon crystallisation rate per unit magma in the saturation interval (i.e. a flat line in Fig. 1a) in their attempt to estimate pluton-scale magma fluxes, which we do not consider here. ). All three approaches yield similar distributions, (Fig. 1a) – a consistency that extends in thermodynamic models to a wide range of whole rock compositions despite greatly varying saturation conditions (Fig. S-1). Distributions #1 and #2 assume linear cooling of a single magma batch; interaction of multiple magma batches and variable cooling rates may distort the distribution, though an abrupt truncation at eruption must feature in all volcanic zircon age spectra. Given such a prior expectation of the form of f(tr), we may quantitatively test the performance of each common age interpretation as a function of N and ∆t/σ by drawing N zircons from a crystallisation distribution with arbitrary saturation and eruption ages, adding analytical uncertainty as a Gaussian random variable with variance σ2 relative to the ∆t of the distribution, applying each age interpretation to the resulting synthetic dataset, and repeating the process very many times for each N and ∆t/σ of interest. However, due to the consistency of theoretical and empirical zircon crystallisation distributions, we may also use such a distribution as prior information to constrain a likelihood-based Bayesian eruption age estimator as follows. Given an observed dataset and an accurate f(tr), one may readily calculate the likelihood of obtaining the observed dataset from the crystallisation distribution for any given saturation time and eruption time. Gelman, A., Carlin, J.B., Stern, H.S., Dunson, D.B., Vehtari, A., Rubin, D.B. (2013) Bayesian Data Analysis. CRC Press. ). After an initial period of equilibration, the series of accepted proposals takes the form of the stationary distribution of a Markov chain (Fig. S-3), which provides both the mean and variance of estimated zircon saturation and eruption ages. In order to test the sensitivity of this approach to the choice of f(tr), we calculate Bayesian eruption age estimates using (1) the MELTS crystallisation distribution (Fig. 1a) from which the synthetic data were drawn, (2) a uniform relative crystallisation distribution (i.e. a flat line in Fig. 1a), and (3) a “bootstrapped” distribution, a truncated kernel density estimate of each synthetic dataset (Methods). We explore the parameter space from ∆t/σ of 0.01 to 10 and N of 1 to 1000, which includes ranges applicable to both ID-TIMS and in situ geochronological techniques. As expected, weighted means are accurate at very low ∆t/σ, with the lowest absolute error and accurate reported uncertainty at ∆t = 0.01σ (Fig. 2a,e), but fail at high ∆t/σ, with absolute error not lower than ∆t/2 and highly inaccurate reported uncertainty (Fig. 2d,h). Conversely, the youngest-zircon approach performs poorly at ∆t = 0.01σ with high absolute error and substantial over-precision, but comparatively well at ∆t = 10σ. Such interpretations might remain useful if ∆t/σ were readily determinable for natural datasets. Problems emerge at intermediate levels of age dispersion. At ∆t = 1σ, all three traditional interpretations begin to fail visibly above N = 3, with high absolute error in youngest-zircon interpretations, and under-estimated uncertainty in both weighted-mean and low-MSWD weighted-mean interpretations, for instance by a factor of two at N = 10 (Fig. 2b,f). At ∆t = 2σ, the problems with weighted-mean interpretations are accentuated, while youngest-zircon interpretations coincidentally perform well at moderate N (due to competing biases which happen to cancel at N = 5 and ∆t = 2σ), but ultimately still fail at high N due to analytical outliers. These problems are compounded by the fact that the average MSWD at ∆t = 2σ is only 1.26, statistically indistinguishable from the near-unity MSWD of a dataset with ∆t = 0.01 σ until one has characterised more than ∼700 individual zircon analyses (Fig. S-4). 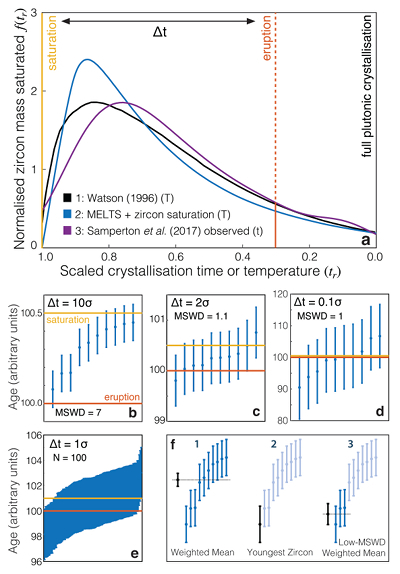 Even magmatic age heterogeneity as high as ∆t = 5σ is not clearly distinguishable from instantaneous crystallisation on the basis of MSWD for datasets smaller than N ≈ 50, and data sets with ∆t/σ less than two are generally indistinguishable from instantaneous crystallisation at any practical N (Fig. S-4). In contrast, the Bayesian eruption age estimate yields slightly higher absolute error than the weighted mean at ∆t = 0.01σ, but otherwise equals or outperforms all other approaches across a wide range of N and ∆t/σ, with the closest to consistently accurate reported uncertainties. Notably, this result is not highly sensitive to the exact choice of f(tr), as the Bayesian estimate assuming a uniform f(tr) only diverges from the equivalent estimate assuming the true prior at high ∆t/σ, and only then for N greater than typical in TIMS studies (ca. 5-20). ). As seen in Figure 3, the results are suggestive of a youngest-zircon interpretation for the Fish Canyon Tuff and a weighted-mean interpretation for the Bishop Tuff – congruous with the dramatic difference in dispersion between the two datasets. If all zircons were strictly autocrystic, the presence of older outliers would suggest that we are incompletely sampling the zircon saturation distribution, and thus over-estimating the eruption age. 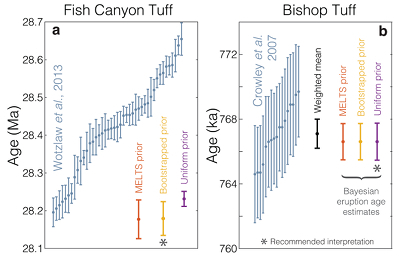 Including xenocrystic outliers in the Bayesian age interpretation thus counter-intuitively leads to under-estimation of the eruption age and divergence between Bayesian and weighted-mean ages for the Bishop Tuff (e.g., Fig. S-5). 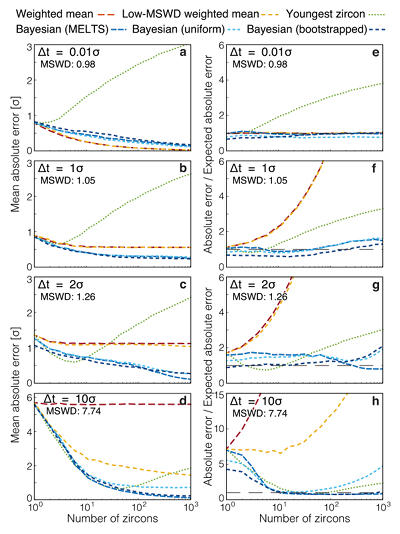 Considering the results of Figure 2 in context of the variance of the MSWD (Fig. S-4), for most natural datasets we cannot rely on sufficiently low ∆t/σ to justify a weighted-mean interpretation even at low MSWD, nor in general can we justify a youngest-zircon interpretation except at low N and high MSWD. In the absence of reliable external evidence for instantaneous crystallisation, the greater precision obtained by a weighted-mean approach is illusory. A likelihood-based Bayesian estimate appears to perform competitively under all scenarios, and is the least likely to underestimate the reported uncertainty. Galbraith, R. (2005) Statistics for Fission Track Analysis. CRC Press. ), and is also likely to outperform the “traditional” interpretations. In this context, the main advantage of our approach compared to an analytical equivalent is merely the ability to specify numerically an arbitrary f(tr) derived from a physics-based model. While our approach may decrease the impact of subjective interpretational decisions, it does not eliminate them entirely: we must still choose a method by which to estimate f(tr). This relative crystallisation distribution is well-determined for a single magma batch (Fig. 1a #1-2), and may be empirically estimated (“bootstrapped”) by a kernel density estimate in datasets with highly- resolved dispersion (Fig. 1a #3). Even when data are inverted with an f(tr) that does not match the distribution from which they were drawn, a Bayesian approach still significantly outperforms traditional interpretations (Fig. 2, Figs. S-6, S-7). Nonetheless, distortions may occur, particularly in datasets featuring extreme outliers, or if our critical assumption that f(tr) falls to zero at tr = 0 (i.e. no crystallisation after eruption) is violated by contamination, unrecognised lead loss, or other open system behaviour. ), and emphasise further study of the effects and detection of lead loss for all U-Pb techniques. Moreover, even though zircon saturation in magmas is empirically well understood and distinct from whole rock crystallisation to the solidus (Boehnke et al., 2013), U-Pb zircon ages are traditionally interpreted within uncertainty as reflecting bulk crystallisation or eruption. Fortunately, magmatic zircon crystallisation behaviour is understood via empirical saturation equations (Boehnke et al., 2013), kinetic models (Watson, 1996), and observation of natural systems (e.g., Samperton et al., 2017). We also consider a thermodynamic model integrating major and trace element evolution with empirical zircon saturation equations (Boehnke et al., 2013; Keller et al., 2017), as well as an observed average plutonic zircon distribution (as a function of time) derived from CA-ID-TIMS of both single zircons and sub-grain zircon fragments (Samperton et al., 2017). Throughout the geologic record, zircon provides crucial time constraints for processes ranging from evolution and mass extinction to magmatism and crustal differentiation (Bowring et al., 1993; Mundil et al., 2004; Harrison, 2009; Schoene et al., 2015; Samperton et al., 2017). However, the crystallisation of a suite of zircons in a single igneous rock sample has often been assumed to occur rapidly relative to analytical uncertainty, justifying the use of statistical approaches such as the weighted mean (e.g., Bowring et al., 1993). This intensive distribution should not be confused with the zircon populations considered by Caricchi et al. (2014, 2016), who assume constant zircon crystallisation rate per unit magma in the saturation interval (i.e. a flat line in Fig. 1a) in their attempt to estimate pluton-scale magma fluxes, which we do not consider here. Due to extremely slow parent and daughter isotope diffusion (Cherniak, 2003), zircon U-Pb ages record zircon crystallisation, if not compromised by metamictisation and subsequent Pb loss. In cases where the variance of the dataset is plausibly consistent with analytical uncertainty alone, then some authors may calculate a weighted mean of the entire dataset (e.g., Crowley et al., 2007). To explore the practical application of Bayesian eruption age estimation, we consider ID-TIMS datasets from two well-known super-eruptions with contrasting zircon age spectra: the 28 Ma Fish Canyon Tuff, with ∼500 kyr of continuous zircon age dispersion (Wotzlaw et al., 2013), and the more homogeneous 767 kyr Bishop Tuff (Crowley et al., 2007). Analogous issues appear in other geochronological applications ranging from the interpretation of anomalously dispersed Ar-Ar ages (e.g., Ellis et al., 2017) to the estimation of sedimentary depositional ages from detrital mineral geochronology. The problem of minimum age estimation may also be considered from the perspective of mixture modelling, which can be approached either numerically or analytically (Galbraith, 2005; Jasra et al., 2006), and is also likely to outperform the “traditional” interpretations. Instead, we follow the Metropolis algorithm to estimate the distribution of the eruption age, exploring the likelihood space by moving from its current position to a proposed position in the likelihood space with probability equal to the ratio of proposed and current likelihoods (maximum 1), with each proposal deviating from the previous position in only one dimension at a time (Gelman et al., 2013). Jasra, A., Stephens, D.A., Gallagher, K., Holmes, C.C. (2006) Bayesian Mixture Modelling in Geochronology via Markov Chain Monte Carlo. Mathematical Geology 38, 269–300. Figure 1 [...] Thermodynamic model of Keller et al. (2017) using MELTS calculations. While such assumptions may be justified for sufficiently ancient or homogeneous samples, crystallisation timescales may span 200-700 kyr for magmatic zircons (Lissenberg et al., 2009; Wotzlaw et al., 2013; Samperton et al., 2017). For instance, modern U-Pb Chemical Abrasion – Isotope Dilution TIMS (CA-ID-TIMS) ages (Mattinson, 2005) on single zircons and zircon fragments may surpass 0.05 % (2σ) accuracy and precision (e.g., Schoene et al., 2015; Samperton et al., 2017) – equivalent to 50 kyr in a 100 Ma sample. Absolute time constraints are critical for establishing temporal correlations, testing casual relationships, and quantifying rates and durations throughout the Earth sciences (Reiners et al., 2018). Here, a plethora of competing age interpretations have developed in the literature, falling into three broad categories (e.g., Samperton et al., 2015) shown in Fig. 1f. Consequently, zircon crystallisation age heterogeneity is increasingly clearly resolved in a wide range of magmatic contexts (Wotzlaw et al., 2013; Samperton et al., 2017). Figure 1 [...] Observed zircon crystallisation distributions of Samperton et al. (2017), shown as a kernel density estimate for all autocrystic zircons, truncated at +/- 1 kernel bandwidth. Consequently, we recommend sub-grain microsampling or microfracturing wherever possible in TIMS analyses (e.g., Samperton et al., 2017), and emphasise further study of the effects and detection of lead loss for all U-Pb techniques. Recently, however, continual improvements in analytical precision and accuracy have fundamentally altered longstanding assumptions of geochronological age interpretation (Schoene, 2014). As an intermediate between (1) and (2), one may calculate a weighted mean of only the N youngest analyses such that, given the acceptance distribution of the MSWD (Wendt and Carl, 1991), the MSWD of this subpopulation does not exceed a value deemed acceptable for N analyses (e.g., Schoene et al., 2015). Watson (1996) was the first to consider the form of the relative zircon crystallisation distribution as a function of temperature, calculating a theoretical distribution on the basis of kinetic constraints, characterised by a rapid onset of zircon crystallisation followed by a gradual decline. In contrast, where there is an expectation of slow crystallisation relative to analytical uncertainty, or ages are highly dispersed, the youngest single analysis may be considered a better estimate of eruption age (e.g., Wotzlaw et al., 2013).